Another price cut just in as Giulio Riggio in the new Palma office of Fraser Yachts reports a price reduction for Azimut’s 30.9m Paprika. 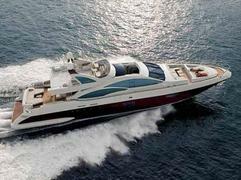 Built in 2008, she sleeps six guests in a master, one double and one twin cabin and cruises at 30 knots. Originally listed at €8.1 million, she is now asking €6.75 million.